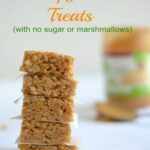 These rice treats have no added refined sugars or marshmallows. They are gluten free and naturally sweetened using honey. The protein from the peanut butter makes them a great little snack to put in the kids lunchboxes or afterschool. Heat the honey, peanut butter, vanilla and salt in a pan over low heat until it all melts together. Pour the rice cereal into a large bowl and pour the melted honey and peanut butter over it. Stir together. Press into the baking pan HARD using either a rubber spatula or your hand with wax or parchment paper.